Abstract: this paper describes rss4you a web-based news aggregator that provides users with a social navigation feature. It aims at augmenting current syndi cation by using an alternative information navigation model: relying on others activities. The cornerstone of rss4you consists in a voting systems that allow you to rate the RSS feeds you syndicate. Every user hence has a list of his/her favorite RSS feed s he/she can share with others (in an OPML format). Based on this favorite list, the system retrieve users with close interests (based on the similarity of their feeds weight with the ratings) and hence recommend you to have a look at RSS feeds syndicated by users with close interests. A list of the most popular RSS feeds is also provided. The system, though in beta version is used to test various concepts of social navigation. 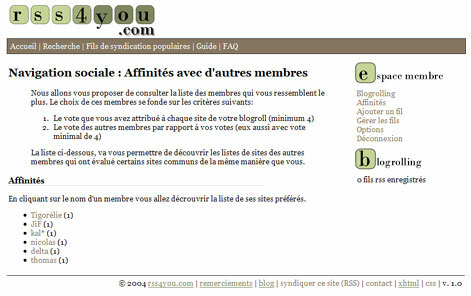 One of the concrete manifestation of the long-time awaited 'Semantic Web' is the RSS syndication. As a web content format derived from the XML language, RSS is machine readable. This means that it is possible for software to check the changes and aggregat e the news in a program called "news aggregator". Such a software allows you to improve Web navigation by offering an efficient way to access a wide range of news in a smaller amount of time. it has to be in French (because there were no French-speaking aggregator at that time, now there are just two: rss4you.com and ifeedyou.com) and in English. we should provide it with an added value: which turned out to be a social navigation feature as we will describe in this paper. This document will first explain the very topic of social navigation, from a wide definition to a more software-related perspective. We would like to explicit how syndication could take advantage of social software results to improve web navigation, and i ts corollary information foraging. Then it will describe rss4you, drawing on the concepts we explained. We conclude by describing results from a brief user-testing study and future research/development avenues. Social navigation is a term coined by Dourish and Chalmers (1994) that refer to situations in which a user's navigation through an information space is guided and structured by the activities of others within that space. 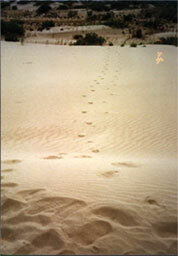 One the simplest example is the footprints in the desert or in the snow: when one is lost somewhere, he or she tends to find footprints in order to finds his or her way. The point is to find traces from other's activities to help you performing the task you want to (e.g. escaping from this awful desert). Humans as social beings prefer to rely on other's than finding their own to solve their problem. When lost in a city, it is indeed easier and faster to ask someone for y ou way than finding your way on a map. This is direct social navigation (there is a contact between the actors), whereas following others footprints is indirect social navigation (the contact is anonymous). Of course, social navigation can be used in more complex context, like for instance selecting "something" worth. As Dieberger (1999) pointed out, the number of car parked in front of a restaurant, as well as the waiting line before a theatre are indicatio n of the place popularity. A well-known example of social navigation tool is what Amazon display at the end of every product description they sell: "Customers who bought this book also bought:..." with a list of other products. This list corresponds to all the rela ted items bought by people who ordered the product you are currently browsing. The point is to access traces of other users' activities with the goal to facilitate locating and evaluating information. Thus, such a system could provide recommendations. We are here in a context of 'information foraging'. News aggregation is a way to gather lots of information from various sources and to complete different goals. It could be either leisure activities, checking the news or for more work-re lated purposes. One of the most interesting domain of information navigation is when you enter a new field and you try to get relevant sources of information. The easiest way to find them is perhaps to find a specialist and ask him what are the most impor tant sources he/she uses. This is of course tricky: you cannot find an ad-hoc network specialist or a nanotechnologist down the street. But the Web is interesting for that matter: lots of specialists lives there. By applying social navigation concepts, the method is simple: it consist in finding specialists. Then of course it is possible to communicate with them. But (this is the second limit), specialists are always busy. It would be great if you could access what they do and what they read: this is simply traces of their activities: a news, a blogpost, a publicationÖ These should be seen as "footprints in the snow". This claim comes from an empirical feeling. What we want to express here can be expressed simply: "If I can access to what specialists of a domain produce and read, this could act as a recommender for my own activity: finding relevant information". A first limit of course is that lots of specialists do not blog at all, this work only for a limited number of fields. Few years ago, a social way to navigate over the web was to check the bookmarks displayed on each others' homepage. 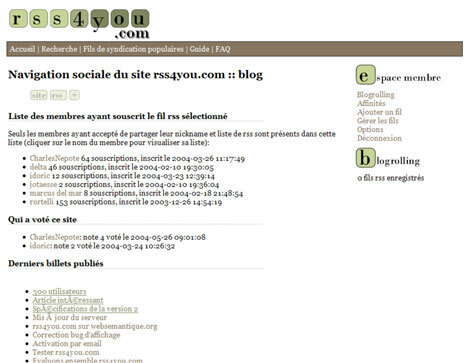 Bookmarks were the first attempt to structure social networks and use them as a recommender system. A person (defined by a homepage) was linked because he/she was trusted to be an informative and valuable contact). Now we have RSS feeds. An RSS file describes a structured content (it is a list basically) related to an identity (the author(s)). In our "social navigation" framework, RSS is a trace of people activity since it contains news, links, description of what i s done, ideas and so on. Therefore, in the context of discovering new information in a domain I fancy, it could be very useful to know who shares the same interests with me. This could be done by knowing which RSS feeds are aggregated by people wh o share interests with me. There are already different way to gather those indirect social cues. Social bookmarks systems like del.icio.us allow people to display the useful links they browse. It is of course possible to aggregate the RSS feed generated from this. Mo reover, 'blogrolls' displayed on blogs is a common way to show your social network and your daily readings. We believe that it is a very powerful tool. This is intricately related to social networks and social software. In terms of commun ication and information navigation, social software are weak because meeting or interacting with someone because you like big american trucks, pokemons and Mario bros is unnatural and inefficient! The main reason is because the interaction is not well gro unded. Nevertheless, asking someone that you want to discuss about something related with his/her activity (blogpost, research paper/project) is much more real: the interaction will be grounded! A blogroll combined with blog content provide a basi s for communication, we believe the blogroll to be definitely more powerful. The thing is that you do not put all your bookmarks and daily readings on your blogroll. What you aggregate (your OPML file) is more complete. This is the point of the " Share Your Opml" initiative which aggregates a community of subscription lists (a list of RSS feeds in OPML). It is hence possible to see what are the most aggregated RSS fe eds. Other tools are of interest for that matter. Technorati has a different approach: it allows you to know your 'cosmos', that is to say who linked you, hence who shared the sam e interests with you. In addition, snother way to check the trends is to use Blogpulse. Thanks to machine learning techniques, it display trends and top links. rss4you is basically a web-based news aggregator, close to others like MyFeedster or MyYahoo. The reason why it is web-based is because it provides users with a way to access feeds from any computer. They enter the url of the RSS feeds they want to subscribe to and the aggregator displays the news on a html "blogrolling" page like the one depic ted here. It only shows the name of the website as well as the titles of the last news/posts so that users click on the link if they are interested. At the moment, it is possible to export your blogroll (i.e. the list of RSS feeds you aggregate) in a OPML format. The import is currently being implemented. For each RSS feeds the user subscribed to he/she is required to rate it (from 1 to 6, ranging from cool/useful to mandatory reading). Hence, each user is defined by a profile of his/her favorite RSS feeds. rss4you then retrieves other users with close interests. The proximity between users is defined by the number of RSS feeds with rating above 4 the users have in common. 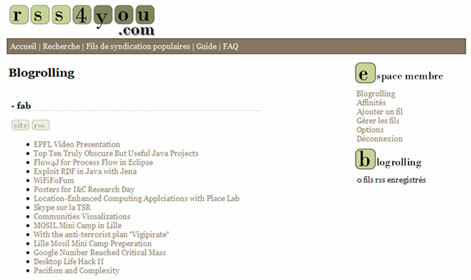 rss4you hence recommends the user to have a glance at close users' blogroll. This is the first added feature of rss4you: a matchmaking system to discover new interesting and relevant sources of information as well as people who have close interests with yours. It is also possible to check who subscribed to which RSS feed, if they rated it and which rating did they gave. This is another feature of rss4you: knowing who rates what and when. On the one hand, it allows to get some additional information about a fee d. One the other hand, it is a way to explore various sources of information by knowing who linked who/what like with technorati. A list of the most popular subscribed RSS feeds has also been established, showing which feeds are the most aggregated in the rss4you community. We tested the aggregator during 6 months. 300 persons registered on rss4you and approximately 30 use it on a regular basis even though it is still a beta version. Nearly 1000 RSS feeds has been subscribed. The low number is normal, we did not advertise th e product a lot since we wanted to use it as a beta version to test the effectiveness of the social navigation features. News aggregation: rss4you is used as an aggregator for people who use multi-desktop (because they have one or two office and a home computer) or for those who travel a lot or if they are on holidays. Social Navigation by checking the popularity of the RSS feeds (60% of the regular users): this use consists in looking at the most popular RSS feeds. Social Navigation by checking the recommender system (60% of the regular users): they said they discovered new sources information thanks to this feature. Social Navigation by checking who subscribed to a specific feed they do not subscribed to (in the popular RSS feed lists or on the RSS feed description page). Users mentioned several problems. Apart from usability troubles we will not mention here, the main complain was that they could not see the posts dates. Another complain was the difficulty to discriminate the new posts from the previous already read. They also mentioned additional idea to make the social navigation feature moving forward. The current problem is that the social navigation is based on the principle that "the more popular I am, the more I popular I get". So, it is difficult for new channels to emerge. A solution proposed would be to present the most popular feeds from less than 3 weeks and to show the feeds which popularity goes up and the one who goes down. One of the other weakness of rss4you is the low number of users. With a more importa nt number, some interesting behavior would certainly appear and we could certainly carry out a detailed social network analysis (studying who links who, with which weight and then address with more details the question of the proximity of users). We described rss4you, a very simple web-based aggregator that provides a social navigation feature. It aims at making users discover new feeds judging from their interests. This project is not intended to deliver a final product. It should better be seen as a testbed to test our ideas concerning social navigation and other community features. We did not advertise a lot about this tool but we are still working on new development to push further the limits of syndication. A dding social features to web aggregation is a way to create a new way of web browsing, relying on other sources than just search engine. This topic is trendy. Bloglines' new version provides a similar service, recommending friends and websites. Users can access to others public subscriptions and add the link they want on their feed list. It is indeed possible to specify which of your RSS f eeds you want to be public so that they can be shared with others. The recommender system also allows users to reach a list of additional feeds that they might like. Bloglines recommendation service identifies what the user already subscribed to and compa res that to what other people are reading. Which is very close to rss4you. An interesting issue would be to compare how the two mechanisms could recommend different sources. Future developments wants rss4you to address various topics. First, we are enabling the display of the publication dates and the recent posts with an adequate interface. Second, we are working on the possibility to store the posts in a "personal memory" s o that you can keep track of old and relevant information. Finally, we want to turn your blogroll into a FOAF file that could describe your network. rss4you will hence be able to display the users' social network with link weighted depending on interests proximity. The number of valuable feeds shared by users could be the index used to underline the proximity between users. Dieberger, A. (1999). Social connotations of space in the design for virtual communities and social navigation. In A. Munro, K. Höök and D. Benyon (Eds. ), Social Navigation of Information Space, pages 35-52. London: Springer. Dourish, P. and Chalmers, M. (1994). Running out of Space: Models of Information Navigation, Proceedings of the Conference Human Computer Interaction'94.